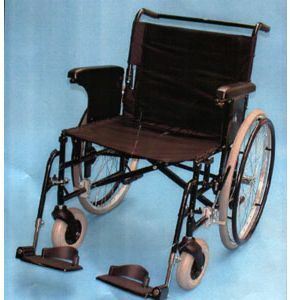 Maxi Meteor Heavy Duty Self-Propelled Wheelchair. Five seat sizes are available, from 16" x 16" to 24" x 20", which means that there is no need for one size to fit all. There are a huge range of extra options that can be ordered with a self-propel Maxi Meteor wheelchair, ranging from elevating footrests to anti-tip rollers to calf straps. Folding frame for ease of transportation. 61cm (24") phneumatic rear wheels.